N. B. To return to the index, simply click on the Res Miranda logo in the top left hand corner of this or any page. 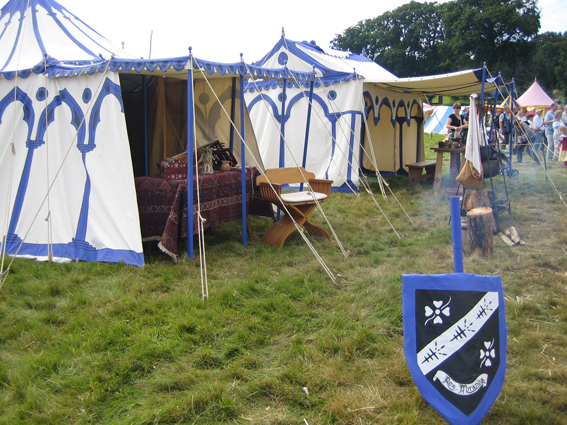 Res Miranda began as a historical re-enactment group, specialising in the Medieval and Tudor periods. Follow the links on the left to find out about the many activities the group commonly demonstrated before the younger members grew up and dispersed. Those who used to take part mourn the death of its youngest member, fondly remembered for his playacting skills, who was tragically killed in a car accident in 2012 at the age of 18. Preparing a meal in the hours before the Battle of Tewkesbury on the site which became known that day as: "The Bloody Meadow"
Lady Anne and Edward with a pet parrot: this species was popular with Dutch painters of the later Middle Ages because of their red tail feathers. See Virgin and Child with Two Parrots by Hans Baldung Grien depicted in our Brief History. It's date is contemporary with the costumes shown in the above picture. 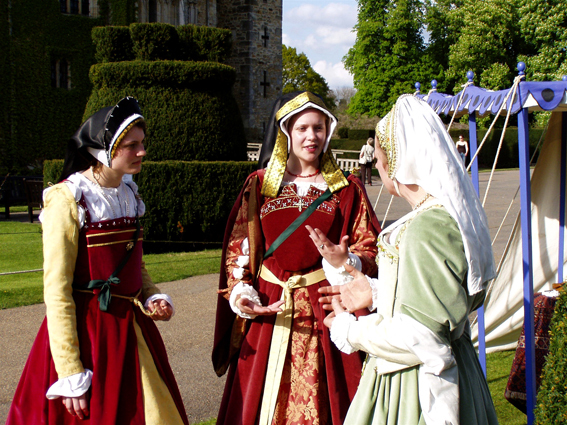 Noble guests of Anne Boleyn at Hever Castle 1536: from the left Mistress Elizabeth and Mistress Bess, in attendance on Anne Sapcote, wife (since 1526) of John Russell who had succeeded his father as Lord Treasurer in 1522, a post he held until the closing months of Henry VIII's reign. In 1538 John was created Baron Russell and also became Knight of the Garter. He received many titles, honours and lands from Henry and was one of his executors. 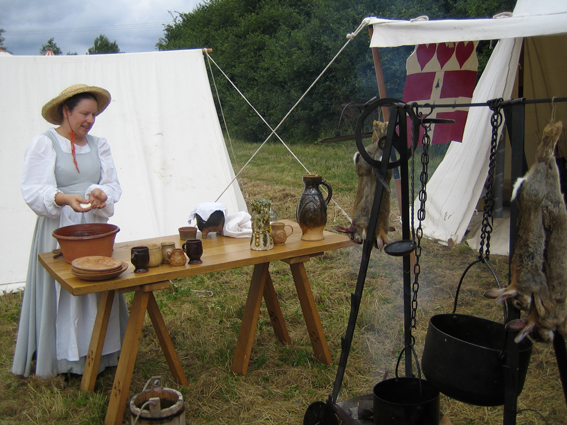 After a break of several years, Anne has now resumed participating in Living History, having joined COTSA: the Companie of the Silver Arrow, an independent group also which participates in Medieval Siege Society events. 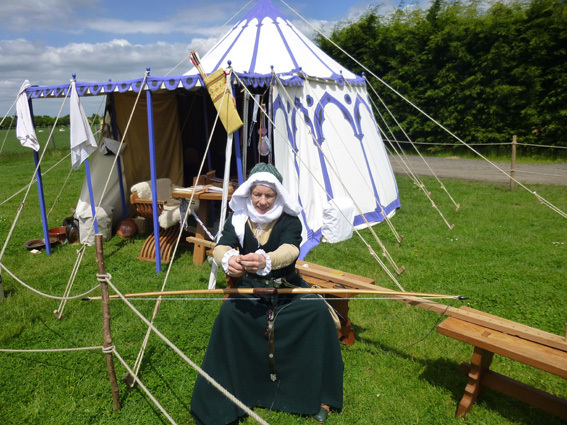 Below: Dame Anne serving a bowstring she has just made at a COTSA event at Edelsborough, June 1st 2113.